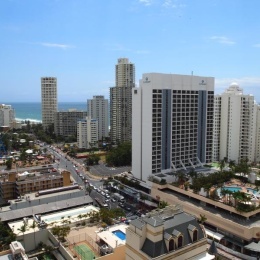 Luxury Apartment 2 Bedroom 2 Bathroom on the 20th Floor of The Towers of Chevron Renaissance Resort in Surfers Paradise. Private Fully Self Contained Accommodation with Stunning Ocean, City and Resort Views. 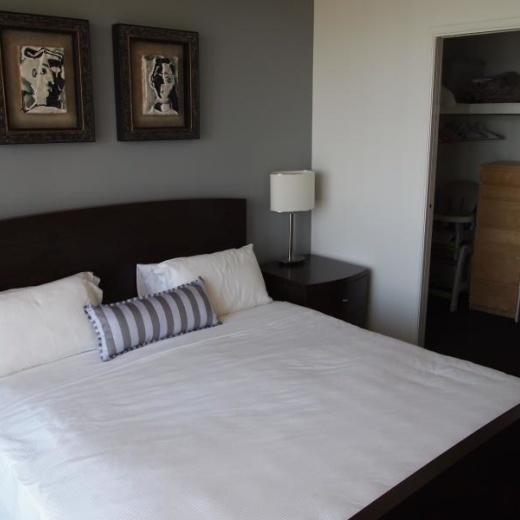 Deal directly with the owners of this 2 bedroom Apartment and SAVE $$$$ We pride ourselves in having a CLEAN, fully Furnished, well appointed and presented apartment with all the comforts and modern surroundings you would expect. The apartment has a modern décor, with a 50" LCD/LED Television, extensive Foxtel package and Home Theatre in the lounge, and a smaller 32" television in the master bedroom. Included in the self contained apartment is linen, cutlery, crockery, gourmet kitchen and utensils. FREE WIRELESS INTERNET and Australian Landline Phone Calls. The apartment configuration is 1 Queen Bed in the master bedroom (with ensuite) and & 2 Single Beds in the second bedroom. We can provide a free air bed if required, and can also provide a free porta cot and high chair. The apartment can accommodate a maximum of 5 people. As private owners, we like to regularly holiday in the apartment. We have therefore made every effort to make your holiday luxurious, enjoyable, stress and hassle free, and one to remember. Once you are there you won't want to leave. Our special meet and greet service will show you around the resort and all of the great facilities the Chevron has to offer. Check in is from 2pm to 6pm. A meet and greet service is available after 6pm, but does require an additional cost. It is a NON SMOKING apartment. Please note, pricing is subject to change and there is a minimum stay period. Please confirm pricing with the owner. Reduced stay periods may be accepted if there are available dates. Please enquire about available dates.